• Dolphin Hand Pumps – fit directly on top of a Fionnar 19lt bottle. Really handy for outdoor events or camping but remember it won’t provide chilled water. On initial installation, we will calculate the amount of people going to be using the cooler and will leave you plenty spare bottles of Fionnar so you don’t run out. Thereafter, tailored to your requirements, our team will either automatically top-up your stock or wait for notification that your stock is getting low. 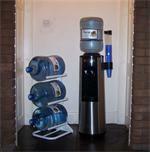 All Water Coolers require to be sanitised regularly. This aspect of the business is extremely important to us and on installing your Water Cooler, we will establish a ‘quarterly sanitisation programme’ that’s convenient to you. The coolers are ‘ozoned’ and date of visit is recorded.